Many of you will know that Beef Bourguignon is a traditional and popular French dish. Beef Bourguignon is a flavourful stew prepared with beef that is slowly simmered red wine with garlic, onions, carrots, a bouquet garni, and garnished with pearl onions and mushrooms. I learned that it was originally a peasant dishes, but over the past few years has been refined and now appears on menus at Michelin star restaurants. I have also seen various vegetarian and vegan versions of the Bourguignonne in magazines and cookbooks. I must admit as someone who has never eaten beef, the colour of the ‘muddy brown’ gravy just did not appeal to me, so I had never bothered making it, until yesterday of course. I had some fresh chestnuts left over from Christmas that were starting to look like polished decorative pebbles. Plus a recipe of vegetable based Bourguignonne gave me another opportunity to cook from one of my Christmas presents: Rachel Demuths Green World Cookbook. 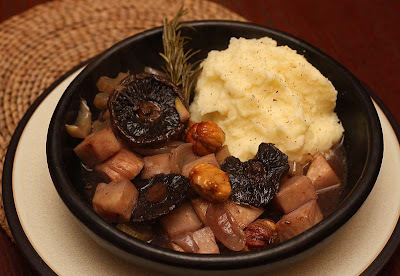 This Bourguignonne contains home grown garlic, baby onions and rosemary. This is also my entry for this weeks Weekend Herb Blogging, which celebrated its fourth Birthday last year. WHB was started by Kalyn of Kalyns Kitchen. It is now and organized by Haalo of Cook Almost Anything Once, I think this is a great way to get food bloggers to cook with what is in season and growing locally. This weeks WHB No. 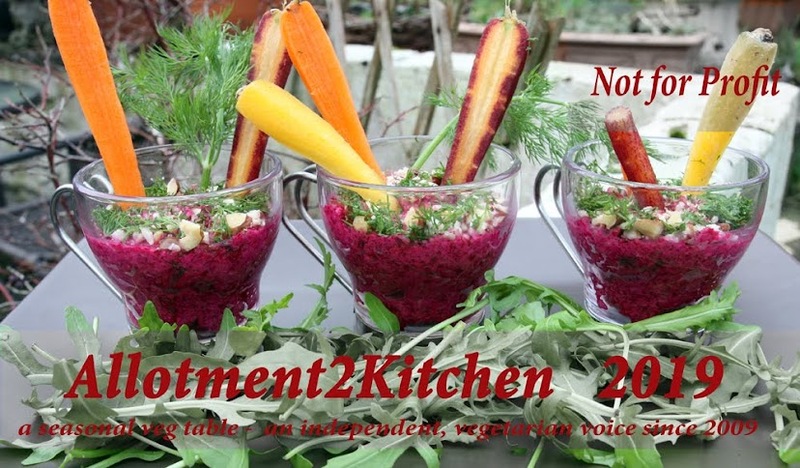 216 is being hosted by Maninas: Food Matters. This made me smile. The first time I ever submitted to WHB was last year with a Coriander, cumin and chilli quiche and guess who was hosting then, Maninas. What a splendid surprise for me. The question is which of the home grown ingredients should I be showcasing. I decided upon the rosemary. 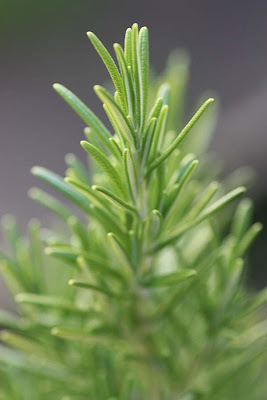 Rosemary is native to the Mediterranean. I think it is such a reliable herb especially during the winter, when the softer herbs such as basil, mint and coriander are in short supply. It is also so easy to grow not requiring much maintenance. I love brushing my hand on the rosemary bush for its heady scent. I think it is a very good both fresh and dried for cooking, but have you ever wondered where it got its name from. Legend has it that the Virgin Mary spread her cloak over a rosemary bush while she rested and as a result of this the flowers turned blue like her cloak. From then on, the bush was called ‘Rose of Mary.” Rosemary is also known as ‘Sea rose, Herb of Crowns, Mary’s Tree, Guardrobe, Incensier, Elf Leaf, Sea Dew, Dew of the Sea, Polar Plant, Mary’s Cloak, Stella Maria, Star of The Sea and Compass Plant’. Wow, so many beautiful names for one hardy plant. We had this with mashed potatoes. Wow D gave it two thumbs up declaring it the most delicious meal of the year so far. The mushroom gravy lightly infused with the flavour of the rosemary is quite silky, and the celeriac chunks kept their shape well. I think this dish tastes even better the following day, as the gravy has a chance to penetrate through the exterior of the chestnuts, especially as these were fresh and roasted in the oven and this made them melt in the mouth. Previous to that, they tasted just a tad powdery. Use a large, deep baking tray, big enough to take all the vegetables. Heat the olive oil in the baking tray. Add the garlic cloves and onions and roast for 15 minutes. Add the celeriac and celery and stir well and road for another 30 minutes. At this point carefully tip all the vegetables into a large ovenproof casserole dish with a lid. 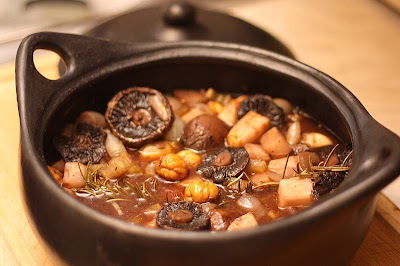 Stir in the cooked chestnuts, mushrooms and herbs and season to taste. Add the wine, tamari, tomato puree and stock. Stir well to combine. Now either reduce the heat in the oven to Gas mark 3 and cook for a further 2 hours or simmer gently on the top for 1 hour. Stir occasionally to prevent vegetables sticking. Check for seasoning before serving. 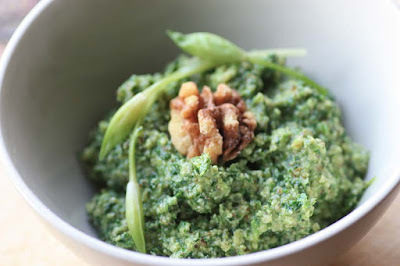 Adapted from Rachel Demuths Green World Cookbook. I think this is going to be one of my most used books of 2010. Looks super tasty! Mark me down for anything with mushrooms! 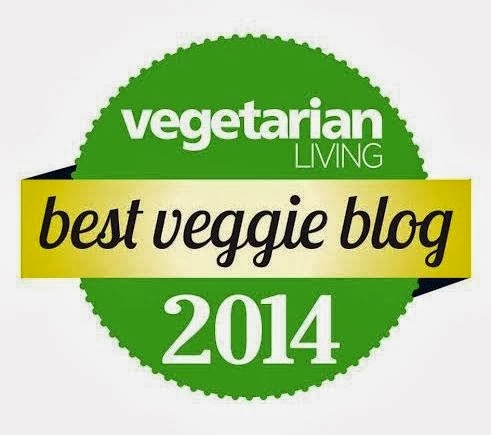 I love vegetable Bourguignonne, and yours sounds especially delicious! Such a brilliant idea to add chestnuts, too - I can just imagine how heavenly they tasted with the mushrooms! Another interesting post - so much to comment on. Sounds really good - I love Rosemary too especially as it's a good memory herb, but didn't know about the Mary connection (CT did of course). I have Rachel Demuth's Green Seasons Cookbook and have made Borlotti Bean & Chestnut Stew a few times and that's really good too. Wondered how you find the black clay cooking pot? I keep seeing them around, but not really sure if they work and they are quite expensive. Mmmm - sounds delicious, I love mushrooms and use wine in a lot of my cooking, it really adds flavour and the red adds colour. What a wonderful recipe, I have been cooking alot with chestnuts recently so this fits in perfectly. I love your seasonal fruit and veg charts in the right hand column, making notes now. Come back this weekend as i am hoping to make another dish with mushrooms. It was a new dish to me. I think next time I would add a carrot or two. Green Seasons is on my list and I'll be sure to make the stew. D bought me a clay pot about 6 years ago from a fairtrade place in Greenock for my B'day. Since then every year I have been saving up and treating myself to a black clay pot or a dish or two, so I have built up a bit of collection now. I agree they are expensive and becasue of this, they had always been stored, but I recently thought to myself I don't know when I will ever get that nice house with a big welcoming table, so just better start appreciating and using them now. You do have to be very careful with them esp the first time you cook or bake in them. I do like them, but treat them like family heirloom. I was going to comment on your wonderful pot too: I saw one on Two Fat Ladies a looonng time ago and have had a hankering for them since. I seem to remember a small cupped wood handle that slid in to both holes to help lift the thing out of the oven. Could it be the same thing, and who's the maker? There's something so elusive yet comforting about a mushroom-based stew. Looks delicious. This looks well scrummy, I have never heard of the dish with or without beef. I look forward to trying it one day, yum!! Mmmm, this looks yummy indeed! I also have some leftover chestnuts that really need using so think this will be on the menu some time this weekend, ta! Rosemary is such a great plant. It looks lovely in the garden and can be used as an ornamental as well as in the herb garden, but is wonderful for cooking with too. It's alternative names are interesting. That sounds delicious! I love tamari as an ingredient, and I'm imagining how it would highlight all these other flavors. Cooking with wine is still quite new to me. Thank you so much for coming by RachelEats. If you click on the seasonal chart it will take you to the original site. I think its brilliant. I am so pleased I brough out my pots to use. I could drop dead tomorrow and never enjoy them . I don't know if they are the same as the ones you saw on Two Fat Ladies, as there are no cupped wood handles. These are Tierra Negra and are made in Colombia. Here is there website www.tierranegra.co.uk. Thanks Kella. I hope you enjoy it. Clare, please do have a go with your remaining chestnuts and let me know what your think! I totally agree, and would like to add that Rosemary is also an acquired taste. I understand your prejudice with french cooking. It is meat-centric, something I noted when I went to Paris for my belated honeymoon last year. But this is the beauty of talented vegetarian and vegan chefs too, they tranforms vegetables to mimic meat based dishes and I think this one is done well, but I can't compare it to the real thing, having never tried it ever. Thanks for coming by Kalyn. What a hearty winter dish this is, Mango. I can almost smell the rosemary. Thanks for the recipe; it looks warming and delicious, perfect for winter. Thanks. I'm looking forward to reading about your organic garden and what you do with the produce from it. Thank you so much for coming by Rose. Once the snow melts away and the cold eases off, I am hoping to start postively thinking about my growing plans, but at the moment I am staying warm. oh my word! 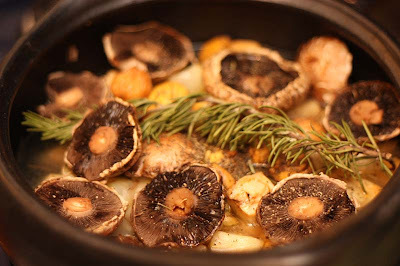 mushrooms and rosemary: a marriage made in heaven! Thank you for coming by Philippa. I made this for my mum for lunch today, with a few alterations to accomodate a fussy husband! It was very delicious, thanks for the recipe! Oh Clare I am so pleased you found it delicious. Thanks for the recipe should really go to Rachel Demuth, but with me changing it a little and you also making alterations, it is becoming a whole new dish. You shouldn't even be asking. I look forward to seeing how your version of this dish has evolved. I will be over soon. Hi Mangocheeks! Once again, thanks for taking part in the WHB. The round-up is now available at http://maninas.wordpress.com/2010/01/19/round-up-of-whb216/. Thank you for hosting Maninas. Sounds like a great recipe, I am making it now! One question though, just one teaspoon of bouillon (for 800ml)? My pot says 4 tsp per litre. It was 1 teaspoon for 500ml, but I upped the water to 800ml for 1 teaspoon as a lot of flavours come from the ingredients. So it is right, but feel free to up it if you wish. Just had to post a message-my first- as I made this yesterday and it was truly superb and having the left overs today- even more fantastic!! Thank you so so much Caerleon Claire. I am so pleased to read your comment and welcome to commenting in the blogging world. Its lovely to make your acquaintance, and hopefully I will hear more from you.